The new nuclear moves are rattling congressional Iran hawks, who have been critical of a series of waivers issued by the Trump administration permitting Iran to continue engaging in nuclear research, including at an underground site that once housed the regime's nuclear weapons program. Ali Salehi, the head of Iran's Atomic Energy Organization, announced on Monday that construction of the two new nuclear plants have begun in the southern Iranian city of Bushehr. "Everything is moving ahead in an excellent manner," Salehi was quoted as saying in the country's state-controlled press. 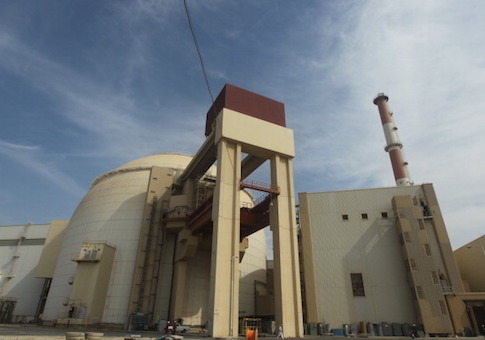 "I was in Bushehr two or three days ago and the Bushehr 2 and Bushehr 3 power plants are being constructed." The State Department would not respond to questions about its policy on Iran's nuclear construction. Meanwhile, Iranian President Hassan Rouhani announced on Monday that Iran had begun filing paperwork accusing the United States of "crimes against humanity" for its reimposition of harsh sanctions on Tehran. "The presidential office's legal department, the justice minister, and foreign minister are required to compile a bill of complaint on crime against humanity against the Americans and those who were involved in sanctions and implementation of sanctions so that we can take it to a competent court for prosecution," Rouhani was quoted as saying. "The world should know that the U.S. move [sanctions] is not aimed at the Iranian government and nuclear technology but it is against the Iranian people's health, environment, ordinary life, foodstuff and medicine," Rouhani said. The news comes amid an ongoing inter-agency battle over how far to go in sanctioning Iran and its illicit activities. Some elements of the Trump administration are angling to keep issuing waivers to permit Iran's nuclear work, as well as its production of lucrative crude oil. The debate has been raging inside the administration for months, with some hardline officials expressing frustration at some colleagues for seeking to preserve the nuclear deal and keep it on life support, despite President Donald Trump's vocal commitment to a policy he describes as "maximum pressure." "Even as we have been systematically re-imposing sanctions related to Iran in pursuit of the better, ‘win-win' deal of which I speak, we have carefully refrained from restoring sanctions in such a way as to obstruct international cooperation with Iran on a number of projects contemplated under the JCPOA that provide Iran opportunities to benefit from nuclear technology in ways not raising proliferation risks," Chris Ford, assistant secretary in the State Department's Bureau of International Security and Nonproliferation, said in December in comments that rankled some Iran hawks. "To accomplish this, the secretary of state waived the imposition of certain sanctions to the extent necessary to enable specified nonproliferation activities involving Iran," Ford explained.